About Gum Disease | Orange County Periodontists | Ajay B. Setya, DDS, MSD Robert C. Hirst, DDS, MS Christen S. Bergman, DDS., MS.
Gum disease, also known as periodontal disease (from perio “around” and dont “tooth”) is a continuous and progressive bacterial infection in the gums and bone surrounding your teeth. As the bacterial infection grows, your gums become inflamed and start to detach from your teeth, and the bone supporting your teeth is eaten away. If the infection progresses for too long, your teeth become loose and can be lost. Gum disease is the leading cause of tooth loss. It is a “quiet” disease that affects millions of Americans and there is often no pain or discomfort until it is severe. Gum disease has also been linked to other serious health conditions such as cardiovascular disease, diabetes, osteoporosis, respiratory disease and cancer. As periodontists, Dr. Setya, Dr. Hirst, and Dr. Bergman are highly trained specialists in the prevention, diagnosis and treatment of gum disease and oral inflammation. They can eliminate the bacteria and bacterial deposits that are causing the disease and restore your oral health. In many cases they can even reverse the damage that was caused by effective gum disease treatment and rebuilding lost gum and bone tissue. When your gums and supporting jaw bone are healthy, complete and attached securely to your teeth, your teeth are firmly in position and stable. Healthy gums naturally attach to the teeth slightly below the gum line. They are pink, firm and do not bleed easily. Bacteria gets onto your teeth and below the gum line from food and other sources. If the bacteria is not regularly removed by brushing and flossing, it forms a sticky film on your teeth known as plaque. The bacterial plaque gives off toxins that eat away at the tooth enamel and gum tissue and cause the gums to become inflamed. This is the first stage of gum disease. As the bacterial plaque continues to accumulate, the disease progresses in severity. The gums detach from the teeth, the inflammation worsens and the supporting bone around the infected teeth is lost. Dr. Hirst showing Steve the intraoral camera used during a periodontal exam. The mildest level of gum disease is a bacterial infection of the gums only and is known as gingivitis. With gingivitis there is some redness and non-painful swelling of the gums, and the gums may bleed when brushing. At this stage there is no detachment of the gums from the teeth and no destruction of the supporting ligament and bone. The disease can be stopped and your oral health easily restored if the bacterial infection is thoroughly eliminated with thorough cleaning. The second level of gum disease is more severe and is known as periodontitis. Periodontitis is an infection of the gums and the supporting bone and causes the gums and ligaments to detach from the teeth and the supporting bone to be lost. As periodontitis progresses, the gums detach further and pockets develop under the gum line between the gums and the teeth. The plaque continues to accumulate under the gum line and hardens into calculus (also known as tartar). The calculus irritates the gums into further detachment and gives greater surface area for more bacteria to accumulate. As this accumulation continues, the inflammation, gum detachment and bone loss is accelerated. Your gums naturally attach to your teeth about 2-3mm below the visible gum line. Gingivitis can exist under the gum line , but there will be no gum detachment from the tooth and no loss of ligament or supporting bone. Periodontitis has started when the gums start to detach from the teeth, forming pockets, and the ligaments and bone have started to dissolve away. Periodontitis advances from mild to moderate to severe. Our doctors use a small probe to measure the depth of gum pockets and can see the extent of bone loss in X-ray images. 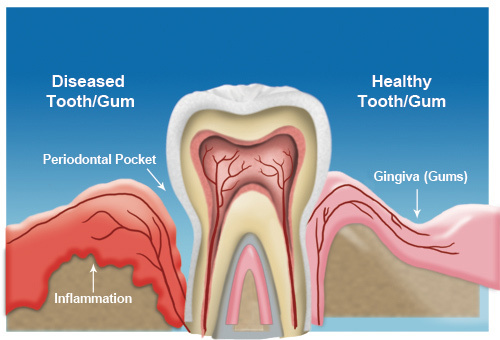 Gum pocket depth is between 4mm and 7mm and the ligament and bone loss has advanced. If you notice any of these you should see us for a full examination as these are all symptoms of gum disease. We will tell you if you have gum disease, how far it has progressed and what treatment options are available. Dr. Setya answering Anthony’s questions about gum disease. Our doctors always take the time to ensure you understand what is being done. Though bacterial plaque accumulation and the resulting inflammation and infection is the principal cause of gum disease, there are numerous factors that make you more susceptible to gum disease and cause the disease to progress faster. Smoking: Studies have discovered that the bacteria that most aggressively damage your gums are found in the mouths of smokers. Poor diet: lack of proper nutrition can cause chronic adverse health conditions that make you very susceptible to gum disease. Systemic health problems: autoimmune disorders, heart disease, respiratory disease and diabetes may contribute to gum disease by breaking down the body’s resistance to infection. Medication side effects: Saliva has a protective effect in the mouth, and certain medications reduce the production and flow of saliva. Without enough saliva, the mouth is more susceptible to gum disease. Treatments for other health conditions: Certain disease treatments can weaken the resistance of the gums or cause excess gum tissue to grow around the teeth. Excess gum tissue makes the teeth and gums harder to clean. Female hormonal changes: Hormonal changes can cause the gums to become more sensitive and make it easier for gum disease to develop. Genetic predisposition: One can be genetically predisposed to gum disease, but proper oral care can keep the disease at bay or prevent it from occurring. Mistakes in prior dental treatment: bacteria can accumulate underneath poorly fitted bridges or crowns and become an infection. The human body acts as an interrelated system. A diseased condition in one part of the body can cause damaging effects in other parts. Gum disease is a bacterial infection with chronic inflammation that destroys tissue. The bacteria can enter the bloodstream and cause complications in other in other parts of the body. Chronic inflammation itself can spread and cause damaging effects away from it’s point of origin. Gum disease has been linked to serious health conditions such as diabetes, respiratory disease, strokes, cardiovascular disease and certain types of cancer. If you think you may have gum disease or are concerned that earlier gum treatment has not gotten your periodontitis under control, come see us. Dr. Setya, Dr. Hirst, or Dr. Bergman will conduct a full examination and determine the extent of any gum disease. They will present their findings to you so you understand exactly what is happening. They will formulate a treatment plan and will discuss your treatment options and answer any questions. “Dr. Setya knows what he is doing and he does it competently. He’s skilled in many areas and is quite knowledgeable.